Mining companies are very difficult to analyse. Their profits and cash flows are very closely related to trends in commodity prices and sentiment towards the economy in general which means that they tend to be very volatile. Unsurprisingly, share prices move and up and down a lot too. From an investor viewpoint, the inherent volatility of the sector means that these companies don’t tend to make good buy and hold investments. However, the big mining companies of the FTSE 100 make for very good trading stocks. The shares are very liquid with tight spreads (there isn’t a big difference between the buying and selling price) which makes them easy and relatively cheap to buy and sell quickly. Is the current financial performance good or bad? Is the financial position weak or strong? Are the shares cheap or expensive? They are definitely in favour. The big mining companies have been storming performers over the last twelve months and in recent weeks as commodity prices have been rising. They are largely responsible for why the FTSE 100 has been setting record highs recently. Anglo American has been the star performer over the last year, but has been a disappointing long-term investment. A look at its share price chart below will give you some indication as to how volatile it has been. Most of the other big miners have been bad medium-term investments with all of them losing money over the last five years. 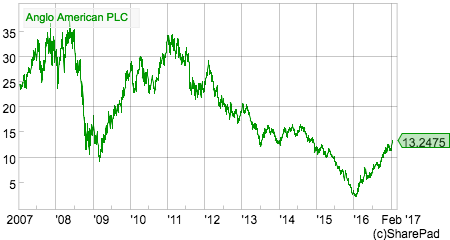 Antofagasta, BHP Billiton and Rio Tinto have beaten the FTSE-All Share Index over a ten year period had you had the patience to stick with them. Randgold Resources has been a phenomenally successful long-term investment. A look at the table below shows you how strong sentiment is towards the mining sector at the moment. The general mining companies such as Anglo American, BHP Billiton, Glencore and Rio Tinto are trading at one year highs and have rallied hard from very depressed levels just under a year ago. Antofagasta is not far away from its year high. Gold miner Randgold and silver miner Fresnillo are some way off one year highs probably due to recent weakness in the gold and silver prices respectively. The profitability of the sector is currently very weak. ROCE is extremely low and way below 10 year averages. If you believe that average levels of ROCE can be achieved in the future then this will require very strong sustained profits growth and lots of discipline when investing money (capital employed). You can see from the table above by looking at the capex ratio that Anglo American and Antofagasta are currently spending more cash on new assets (capex) than they are producing from selling the output from their mines. Capital employed has increased significantly across the sector but is struggling to produce decent returns for shareholders. The high capital intensity of mining companies combined with the uncertainty and volatility of their profits and cash flows is what makes them very risky investments. They also have a lot of fixed costs (labour, maintenance etc.) which makes their profits very sensitive to changes in revenues. When times are good, and commodity prices and mining output are rising, profits can grow rapidly. Sadly, the process works in reverse as well. The finances of the big mining companies look to be reasonably strong in general. Glencore’s fixed charge cover is a little on the low side and investors would probably like to see debt a little lower for Glencore and Anglo American. It’s very difficult to argue that any of the shares look particularly cheap. That said, cyclical companies such as miners tend to look expensive when their profits are most depressed and near the bottom of the cycle as a recovery is often expected. This looks to be the case as strong EPS growth is expected for all but BHP and Glencore. On a simple forecast PE basis, Anglo American looks to be the cheapest share in the sector. Big mining companies are very popular with investors right now. Share prices have gone up a lot over the last year. Mining shares generally haven’t been brilliant medium or long-term investments. Current levels of profitability are poor. The sector is very capital-intensive with lots of cash flow being ploughed back into new assets (capex). The financial position of the sector is generally satisfactory. 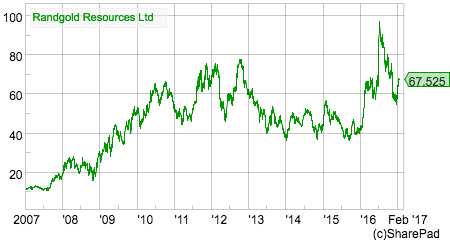 Mining shares don’t look particularly cheap at the moment. For reference purposes, the same tables for the AIM 100 mining companies are shown below.